In the Kitchen with David Lebovitz and I — Newport Sea Salt Co.
Oh hello, so glad you stopped by! Did you want to see the final pictures from the chocolate mousse I attempted to make? I have unstuck myself from the hardened caramelized spoons and cleaned up the floor of sticky golden caramel to now sit down and write about David Lebovitz’s dreamy ‘Salted Butter Caramel Chocolate Mousse’. I love reading cookbooks, and thinking if I ever have all the ingredients I need I would love to make recipes like this one. Well, this week the lovely Butter Cuisine’s Brian and Lori Halloran collaborated with us and made a Sea Salted Butter. It is fantastic! They were kind to stock our market table to share with customers and I was able to bring a butter roll home. Normally, I would buy a baguette and marry the 2 up and perhaps, maybe make a salad on the side. But, not this time. I took out my David Lebovitz cookbook and started to flip through the gorgeous matte pages until my eyes fell upon the perfect recipe to use with Butter Cuisine’s Sea Salt Butter and our flaky Newport Sea Salt - this heavenly chocolate mousse that would use both of our ingredients and use up our heavy cream in the fridge and make for a nice solo dinner for me…I mean ahem, dessert to share with Matt and our boys. Mise en place...and looking pretty! I am a beginner caramel maker and a bit terrified of making it after the first time I attempted to caramelize walnuts for a salad and dipped my finger in the hot liquid (!!!) then stuck my burning finger into my mouth then ripped it out of my mouth to pull a nice heart sized piece off my lip! You would think I would second guess making this recipe after my traumatic experience. Let’s just say, I never made caramelized nuts again for a salad…and anyway, shame on me for trying to sprinkle my salad with sugar. ;) But, chocolate and salted caramel? A perfect match of dark bittersweet chocolate and sea salt flecked dark golden gooey caramel, sold! So here I was thinking I am way beyond my traumatic experience, and place all the recipe ingredient’s together the French way ‘mise-en-place’. Everything was looking really pretty - the local farm brown eggs nestled in a green and white striped bowl, the chopped bittersweet chocolate pieces placed in a bowl from Spain from my sweet friend Elizabeth, a teaspoon of our sea salt in a little bamboo spoon, Butter Cuisine’s creamy yellow sea salt butter coming to room temperature, organic sugar in a shiny copper measuring cup, and a glass measuring cup of heavy cream - all ready to go. I take a few photos (50 or so because I can never get the focal point correct) and read David Lebovitz’s recipe one more time. Then I read it again and again now feeling the nervousness of the caramelizing process. I am now repeating out loud to myself, as my boys are in Connecticut, to not dip my finger in the hot sugar at all costs. With a bit more self pep talk, I cover the bottom of a wide sauce pan with the light cream color organic cane sugar. I place the gas heat at medium and wait for what David says “as the edges will start to brown first”. At this point, I am talking to David out loud and we are on a first name basis. Of course, my sugar starts going all dark brown and melty in the MIDDLE. So, I start to pull at it with my spatula and now I have hard sugar clumps. “Do not touch it with your fingers”, I am chanting to myself because as a baker I would reach out and do that. I waver in between of throwing it out and starting over to let’s just see what happens to this mess. I finally get the sugar to melt, but now David is getting a bit adventurous in asking me to wait for it to smoke??! Okay, the last time I had smoke while I was cooking it was a brick chicken on the grill and the fire department was almost called until my husband rescued me. So, now I am re-reading the recipe another time making sure of the next steps, and drop my spatula on the floor at a crucial time of the sugar about to burn. I go from trying to wash the hardened spoon to recovering a new one just in time to see bubbles popping in my golden caramel mess and place the butter in the pan - and you know what, I swirl the pan with the 2 hot liquids now. Watch out, and thank god I don’t have anyone around me. Hmmm….my new spatula is now covered in the hardened caramel and it is not coming off my spatula, but I don’t deter…. I add the cream and now there is no turning back now….I toss in the chocolate to melt. I am quite certain at this point that David would have covered his eyes and asked me to start over. Now, I am still sticking to the floor as I crack and divide the eggs and whip one half into a white peaked frenzy and marry the golden yolks into the now room temperature bowl of chocolate. With the pillowy egg whites and our flakes of sea salt, I layer one at a time into the waiting bowl. 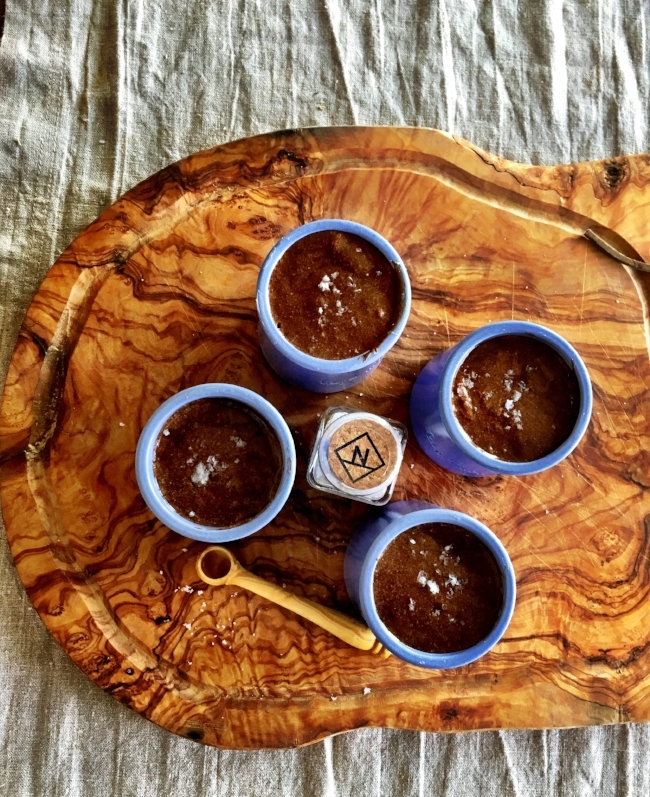 I pull out my La Fermiere little lavender painted ceramic yogurt cups from our travels to France and scoop out this mass of dark mousse and place 3 luscious scoops into each waiting cup. My Francophile friends and I picked up these lovely ceramic yogurt cups while on a girl's weekend in Aix-en-Provence. And here is where I dip my finger finally into the cool chocolate goodness of what is left in the bowl. And you know what? Not bad for my first time with David Lebovitz’s Salted Butter Caramel Chocolate Mousse. And now to do the unthinakble - wait 8 hours for the mousse to chill. Oh silly, David...do you think this is really going to happen??! And now to wait 8 hours for them to chill....who wants to take a bet that there will be a cavernous spoon hole in one of these in the very near future. Bon Apetit! Thank you to Lori and Brian of Butter Cuisine for giving me the inspiration! Click on the below link to see the full recipe or do like I did and purchase his cookbook. I love it!